I really do not know that anything has ever been more exciting than diagramming sentences. Unfortunately, the original English sentence has been lost, and we can only offer conjecture as to the utterer’s intent. However, in the euphoria that X-bar diagrams have brought to linguistic studies, little thought has been given to the problem of how children acquire such diagrams. Clearly, they do not acquire them through Imitation, since few examples are to be found in their daily lives.4 Similarly, acquisition is not the result of Structured Input, or Reinforcement from the parents, since, on the one hand, children are famously oblivious to their parents’ drawings, and, on the other, few parents are even capable of expressing X-bar theory in any meaningful detail. This we may identify as the Poverty of the Stimulus argument. Thus we are led to the inescapable conclusion that children have an innate concept of the X-bar diagram—as part of the Universal Grammar Hypothesis (UGH). Some examples of early childhood diagramming will serve to illustrate this hypothesis. Since the examples were produced by children before the writing stage, the connection to language may appear tenuous, but the underlying X-bar-theoretical features are clear. This last principle is further evident in example (4), “Daddy sleeping,” or “Daddy dead,” a transformation of (3) that retains the Periphery Principle. Another principle is illustrated by example (5), shown with an asterisk as this is obviously not a well formed diagram. This is a clear violation of the Head Movement Constraint. Finally, example 6 is instructive. (6) shows that the child is aware of the Triangle Convention, by which complicated issues not relevant to the current discussion are presented as a shorthand. This usage is particularly noted in diagrams identified as “Mommy”,6 where the entire body is shown as a triangle, indicative of Sexual Avoidance, or at least confusion on the part of the child. 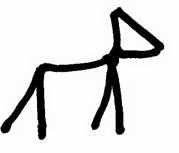 Astute readers will have noticed that (6) is right-headed, and thus was probably produced by a Japanese child. Chomsky, Noam. Oh, just about everything. Jackendoff, Ray, 1977. X Syntax: a Study of Phrase Structure. Cambridge, Mass: MIT Press. McSweeney, Joann, 2005. Alexander Calder and the X-bar. Personal Communication: Facebook. 1 It might be uncharitable to comment that this does not speak well of Alice B. Toklas’ bed game, but there, I have said it anyway. 2 In my opinion, not enough credit has been given to the developers of the previous V-bar and W-bar theories, without whom... but I digress. 3 Some hotheads claim that the number of possible X-bar diagrams is infinite. That strikes me as going a bit far. 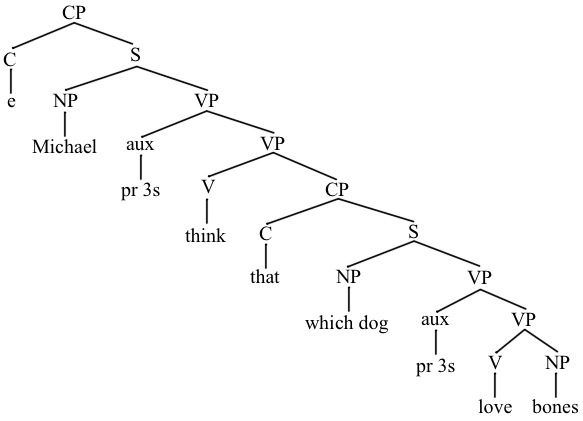 4 McSweeney (2005) has suggested that the X-bar is the basis for the crib mobile, and has gone so far as to generate a Phrase Structure grammar for such devices. 5 This confusion is common and often found well into Graduate School years.